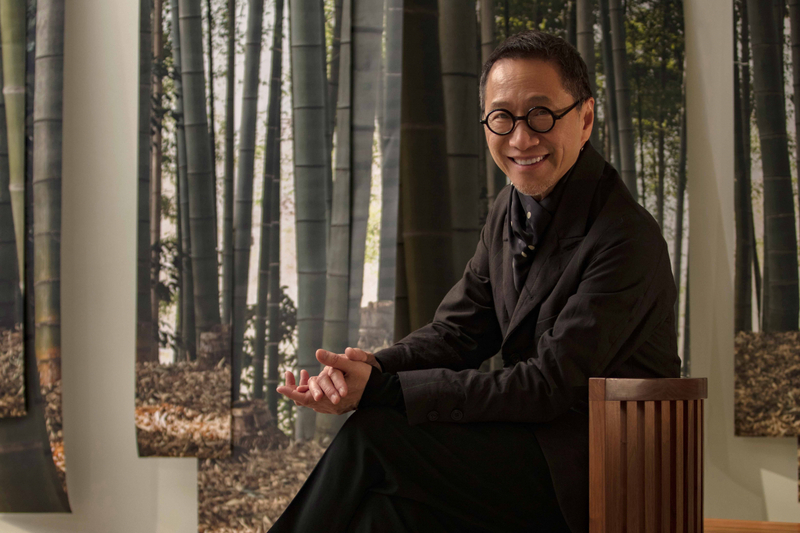 Hong Kong design luminary Alan Chan recently showcased his innate ability to modernise and merge some of the more intrguing elements of classic Asian and European furniture and home accessories. He presented his latest pieces at the second International Design Furniture Fair, Hong Kong within a tranquil, warmly lit environment of textural wood, with grey accents from wool carpets, silver glints from vintage teapots and strips of green from bamboo motifs on wall hangings. During the fair, Chan also displayed his latest range of high-end teaware in the Mr Chan Tea Room. First started in 1993, this year’s Tea Room featured pieces from the Xiyan collection, comprising contemporary ceramic teapots and iron stands and trays made by artisans in Suzhou. Meanwhile, the Silkroad collection, which included a new tea ceremony table for 2017, saw Chinese and English forms incorporated in highly polished walnut pieces. It wasn’t all about tea, however. Visitors to the fair got to admire Chan’s S-shaped lovers’ seat, in which a couple can sit face-to-face – a concept that nods playfully to furniture developed in England from around the 17th century. Admiring glances were also cast upon his latest tables, which can function as dining, desk or other surface space, thanks to moveable interlocking sections. Some of the designer’s latest homeware collections can be seen this month at the Alan Chan X colourliving collaborative display at colourliving’s showroom in Causeway Bay. We sat down with Chan to discover more about his new additions. How did the Silkroad collection idea come up – and why did you name it after the ancient trade route? Over time, I collected two 17th-century [two-seater] “conversation chairs” and I always feel inspired by [Danish furniture designer] Hans J Wegner’s ingenious twist on the Ming dynasty chair. With Silkroad, I’ve infused Asian aesthetics into furniture pieces that originated from Europe. As for the name: the original Silk Road started during the Han dynasty [206 BC-220 AD]. It promoted exchanges of goods, services, knowledge, beliefs and ideas across China, India, and the Mediterranean Sea towards Europe. It became a cultural transmission. This Silkroad collection suggests sharing, a meeting of East and West, of past and present, classic and contemporary, craftsmanship and technology, functionality and form, men and women, yin and yang. Have you used walnut wood in furniture before? The Silkroad collection is my first furniture line using walnut wood. It’s well known for its durability, distinctive colouring and natural patterns with its grain that shows beautifully when it’s used for furniture. Where are the Silkroad collection furniture and Zen carpet pieces made? The chairs and tea ceremony tables that form the Silkroad collection are all made by the same master carpenter from Hong Kong who specialises in traditional wooden furniture engineering. He’s now based in Shanghai. The Zen carpet, made [in China] of 100-percent New Zealand wool has been an element in our projects for 10 years. “Raked gravel” patterns are meticulously worked by hand. Are Zen carpets available only in gravel grey? Yes, because it reflects the small pieces of stone used in Japanese Zen gardens. The exact design is custom-made according to the size wanted. Where did the idea for your contemporary bamboo-motif wall hangings come from? Kyoto bamboo groves are a great inspiration to me in my designs, especially those in the Higashiyama area. I surround myself with spiritual peacefulness every time I’m there. I hope to bring nature to indoor space through floating strips of bamboo wallpaper. When do you feel the most creatively free in your design work? As a designer, I feel most free when I have no concern for the commercial or marketing aspects and can create like an artist. I felt a sense of freedom when creating the Silkroad collection and the Zen carpets. The collections from the Mr Chan Tea Room are all my designs for the rest of this year. I’m partnering with colourliving to create a “home away from home”, a showroom setting of how I would like to decorate my ideal home. Also, there will be another version of the customised tea trunk that I developed for Louis Vuitton last year, so watch out for the new design.